As of today, it includes Platelet Rich Plasma (PRP) following several protocols and Bone Marrow Aspirate Concentrate (BMAC) rich in stem cells, growth factors and anti-inflammatories called Cytokines. As of next week, all may change as the Orthobiologic update taking place in Las Vegas over the weekend will potentially introduce an entire new menu of therapeutic intervention alternatives for musculoskeletal injury and disease. What is Bone Marrow Aspirate Concentrate? What is Amniotic Fluid Concentrate? The source is the pregnant woman coming to term and delivering via Cesarean section. The recovered amniotic fluid is processed, concentrated, and now available as an alternative to Visco-supplemenation with hyaluronic acid. It is a new option and data concerning the length of pain relief is still being determined. Do these Regenerative Medicine alternatives work? When properly applied the answer is yes. What we don’t know is for how long? The effect of Platelet Rich Plasma in injury is intended to speed up the repair process. In the case of Amniotic Fluid, the outcomes are still being studied without a known end point. I have been involved in studying the clinical outcomes of Bone Marrow Aspirate Concentrate intervention for osteoarthritis. The paper I will be presenting this weekend confirms satisfactory results up to two years. The data collection continues. 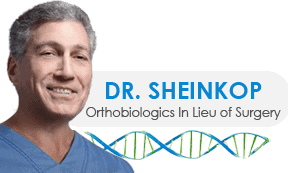 Is there a downside side to Regenerative Medicine and Cellular Orthopedics? In my experience the answer is yes and no. Yes because there is no indemnification for the new world of regenerative medicine; care is an out of pocket self pay undertaking because the field is new and five year outcomes data still not available. On the other hand, at three years, I have seen no adverse events and the vast majority have responded well with improved function and quality of life. Out of over 600 knees and over 100 hips, to the best of my knowledge, seven have gone on to a total joint replacement.